The worldwide magazine debut of the Apple Watch continues this week on the cover of fashion magazine Style in the United Kingdom. 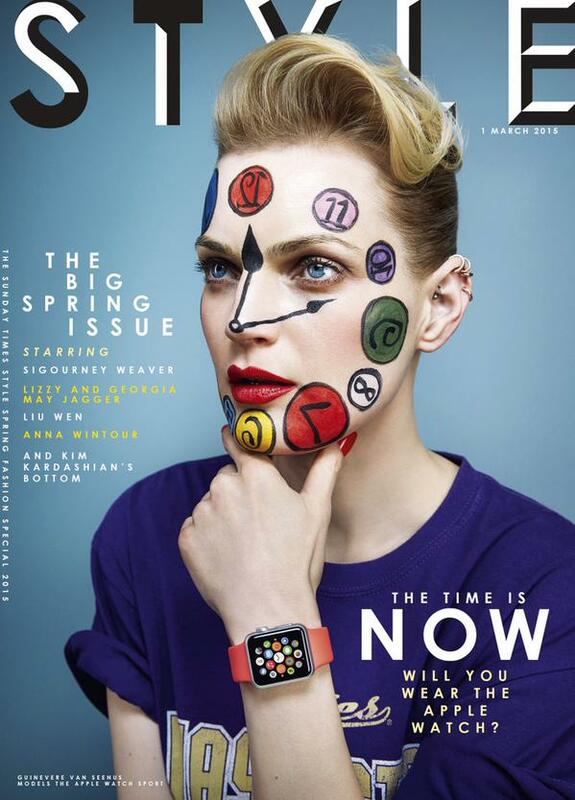 The cover of the Big Spring Issue for March features model Guinevere Van Seenus wearing an Apple Watch and is accompanied by a two-page spread inside the magazine that provides further details about the wrist-worn device, including an interesting hint about the pricing of space gray models. A caption in the magazine spotted below model Guinevere Van Seenus claims that the "Apple Watch Sport with 38mm Space Grey aluminum case and black band" will cost $349. The price is notable given that Apple pundit John Gruber of Daring Fireball previously speculated that Apple may charge more for the space gray Apple Watch Sport and space black stainless steel Apple Watch. "Note that the silver Apple Watch Sport only has four band color choices: white, blue, green, and pink," wrote Gruber. "The space gray Sport edition has only one band: black. I think Apple might charge more for both the space gray Sport model and the space black stainless steel model." Gruber may still be correct given that the magazine may simply be referencing the $349 starting price that Apple CEO Tim Cook announced during a media event last September. While the Apple Watch Sport will start at $349, the stainless steel Apple Watch has been speculated to cost at least $500 and the luxurious Apple Watch Edition is predicted to cost up to $20,000 depending on the band. Apple will provide more details about the Apple Watch at its March 9th media event. Tim Cook better have that face paint at the March event. In the past, Apple used exclusive colors to promote higher-end products (black MacBook, white iPhone 3G) but you never literally paid more for just a color. They also had better specs. Actually that black MacBook WAS literally more for just the color: you could BTO the white to match the specs of the black exactly, but the price was still lower. An interesting case, but far and away the exception to Apple's rule: other than that, colors alone haven't cost more. We can't yet know, but I would not expect the black Watch Sport to cost more (nor less). The iPod Touch costs the same for a silver shell vs. anodized color, for instance, and the Sport is squarely in the mainstream consumer space in a way that the other two lines of Apple Watches are not. I wish we would go back to simpler color names. Why would a UK magazine list the price in dollars? What was the listed GBP price? I guess I'll be getting the space grey sport. I want a sport with a black band and that appears to be the way to get it. Is the larger watch going to cost more? Like is the 38mm sport $350 and the 42mm $400 or $375?? This has literally been discussed to death in the forums. Nobody knows yet. Wait until March 9th. I really hope these leaked prices are very wrong!! Above is the link to the prices that were leaked. My excitement was high for the :apple:Watch, I have $600.00 squirreled away for it and I was planning on buying a second one as a gift. If this is in fact the actual prices my excitement has deflated and that gift wont happen. Paying extra for the 42mm as apposed to the lower priced 38mm (with the exception of the gold watches this is lame at best) The Aluminum and stainless steel shouldnt have different prices between the 38mm and 42mm. You will notice that the Milanese Loop and the Stainless Steel link watch bands can only be bought IF you buy the :apple:Watch with it! So if you want one of each you would need to buy TWO :apple:Watches. All bands are not for everyone! You cannot get a Modern Leather Strap unless you buy a 38mm Watch. Likewise the Leather Loop bands you can only use on a 42mm :apple:Watch. Price. $999.00 for a stainless Steel watch is too high! Apple or otherwise. I have been a Apple person for a long time. I know they cost more than other brands and Im fine with that, However, this device is over priced. I would have expected that the 38mm/42mm (gold excluded) would be the same price and that the bands would all be interchangeable as we were led to believe in every single :apple: Watch add to date. I will wait for the price drop of the v2 or v3. It's not just the price that defers me from buying the v1, but def a good price drop would make me reconsider. I am not joking at all. I understand that it will sell out quickly, but I just think it's an Apple hype thing. I think the novelty will fade fast. The was when Apple wasn't as well known. They don't need such tactics now. As one of the 100 million people who had bought an iPod during the decade leading up to the introduction of the iPhone, I beg to differ. Apple was very well-known at that point in the company's 30-year history.